The ability of a wheel to move backwards when it hits a bump is a very important ingredient in gaining good ride quality. The movement is accomplished in car suspension systems by the use of rubber bushes; many have asymmetrical voids within them to allow this type of tiny backwards movement without adversely impacting on bush stiffness in other directions. But what about in a machine that requires suspension pivot points that can’t cater for this movement, ie those that need non-flexible pivots? In a two wheel machine, especially one that is very light in weight, a leading arm suspension can be designed that will achieve this. Leading arm suspension systems have been used in commercially produced motorcycles (eg the Earles forks) utilised by BMW in the 1950s, and shown here. 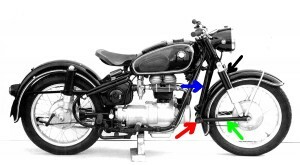 Note that the springs/dampers do not locate the suspension in any way, instead, the leading arms (green arrow) are pivoted at the point shown by the red arrow. The “forks” are indicated by the blue arrow and the springs/dampers by the black arrow. A leading arm design of this type has anti-dive under brakes built in; as the braked wheel tries to keep turning, it pushes up on the pivot point, so counteracting the weight transfer forwards. In fact, some Earles machines are known to rise at the front under brakes. But how does this front suspension design allow a movement backwards when the wheel hits a bump? As shown in the BMW design, it doesn’t – or at least, not much. But as shown in the design of this bike, it does. 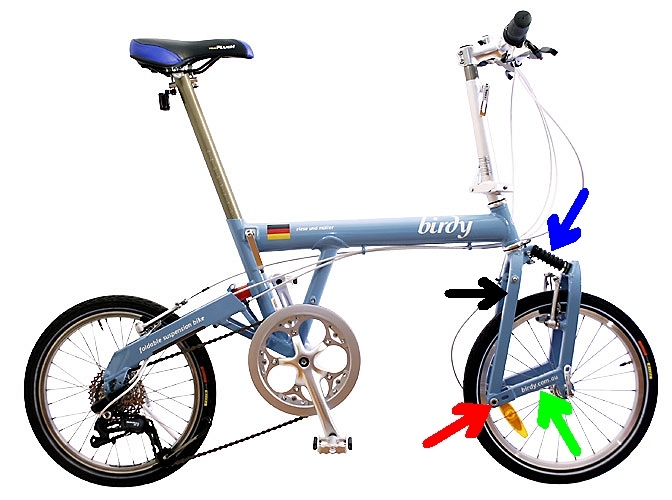 Again the green arrow points to the leading arms, the red arrow to the pivot point, the blue arrow to the spring/damper and the black arrow to the forks. Note how the pivot point is low and so the wheel clearly moves backwards as it rises. The bike is a Birdy folding machine and the front suspension travel is only about 15-20mm. I recently bought one and I am amazed at how well the front suspension works, especially given its minimal travel. It’s not effective over large bumps but it works brilliantly at removing vibration and harshness. It’s also a particularly interesting design because in many suspension types, building-in anti-dive geometry actually causes the wheel to move forward as it moves upward, so making bump absorption worse rather than better. That’s not the case with this design.